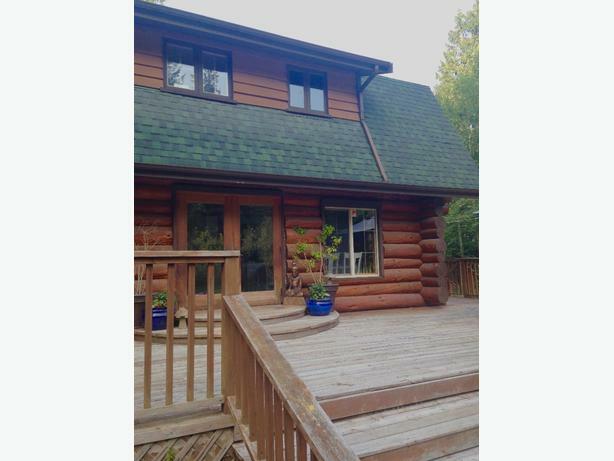 Private Custom Log Home situated on 2.5 acres of flat land. This home is truly what west coast living is about. 3000 sq.ft. of interior space, large gathering areas, farm style kitchen, 4 bedrooms with bonus gym/guest room. The exterior offers a 3500 sq.ft. wrap-a-round deck, spacious 2.5 acres of flat land, swing set & trampoline for the kids. The gem of the property is the tranquil creek that you can explore just feet away from the home. Great location for large families, reunions & retreats!